It's nice. Go watch it. The End. I was mimicking a review post I read last week. Would you believe that "It's nice and go watch it" is more helpful that that review? I shall not point (nor flash) fingers, but try looking for "Bourne Legacy" review. Paranorman is a stop-motion cartoon which talks about the adventures of a boy, Norman as he tries to stop the curse of the witch in his small town. Norman is the freak of the town because he talks to ghosts. The people don't believe him, not even his family. And so, he gets bullied a lot. One day, his seemingly creepy uncle came to him and told him about the witch's curse on some people who use to live in the town, and that he was the only one who can stop it. And there was when the adventure starts. I would say that this is a nice cartoon to watch, but if you're too much of a logical person, or you forgot that the cartoon is mainly targeted at kids, you're gonna have a boring time. I enjoy the little jokes here and there that makes the movie fun to watch, but the suspense to the scary parts were great too. I almost hit the girl who came over to warn Chee Ching not to use her phone because that was the suspense part and I was prepared for the zombie to pounce. (Was very annoyed by those people.) Naturally, when a black figure suddenly shows up next to me, it did make me jump a little. Why would you expect logic in a cartoon? *rolls eyes* It's suppose to be funny and simple enough to make children laugh yet keep the adults entertained in some way. 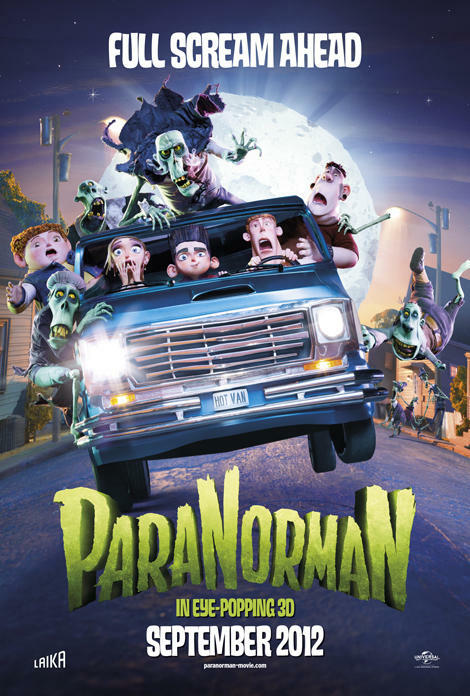 And Paranorman did that. My inner child had a great time, and the more adult side of me was kept entertained. The graphics were a lot softer than Coraline, you can see that the edges are more polished, and the movements flows better. If you haven't watch Coraline, here's the trailer, and you should check it out!! My verdict? YAY! But leave your logical thinking outside the door and don't forget to pick it up when you leave. That's what J_Fish has to say~ Au Revoir~ la deuxieme fois. p.s. It's not worth watching in 3D. Kian Fai: I think it's cool too! !